Simple Green 4 + 1 Select Proportioner provides accurate and easy product dilution, ensuring concentrated cleaning products are consistently mixed to peak performance. This American Society of Safety Engineers (ASSE) 1055 approved multi-product proportioner includes 4 low flow (1 GPM) bottle fill and 1 high flow (3.5 GPM) bucket fill outputs with the capability to dispense up to 5 chemicals or water at 5 separate dilution ratios. 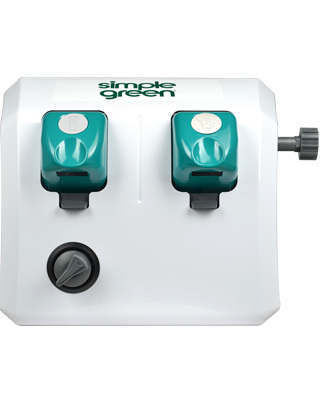 The easy-to-use unit features AccuPro Pressure Regulation Technology to ensure accurate dilution regardless of fluctuations in water pressure. E-Gap eductors provide backflow protection through the use of elastomeric sleeves. The proportioner includes 14 pre-set metering tips that provide 1:2.6-1:447 dilution ratios, one customizable tip for non-standard dilutions or water dispensing, a 4 foot bucket fill hose with convenient storage hook, the option to lock in the on position and an expansive internal workspace for plumbing and pick up tubing.